South Africa’s long-anticipated local elections of August 2016 have been hailed as a major breakthrough for the Opposition, particularly for the DA and its leader Mmusi Maimane. Without doubt this exaggerated response derived from the fact that public opinion has been through a period of unprecedented gloom, so any indication that there might be an end to the long, dark night of ANC rule was welcomed with huge sighs of relief. Even so sober a publication as the Financial Mail talked enthusiastically of the “DA surge”. This seems an odd way to treat an election in which the DA has continued to trudge forward at the hardly electrifying rate of a 2.95% gain over five years and in which the main dynamic factor has been the entree en sceneof the far left EFF with 8.19% and 761 council seats. This, rather than the DA’s more modest push, was the principal reason why the ANC fell back by 9.74% since 2011. It is, indeed, difficult for the DA to advance any faster for its gains now come from only two sources: a differentially higher turnout among minority voters and very gradual gains among African voters. The evidence this time suggests that both things happened – in many white suburbs voting lines stretched from dawn to dusk and the DA vote rose noticeably in many all-African wards. It is not easy to say how much of this was really Maimane’s personal triumph for he is still far less identified with his party in the public mind than the DP was with Tony Leon in the 1999 “Fight Back” election or even the DA with Helen Zille in 2009 or 2014. What can be said, more modestly, was that this was Maimane’s first real test and he passed it. The elections were accompanied by many and varying claims, many of them misleading. In the run-up IPSOS conducted weekly polls, carried by eTV, which showed the ANC trailing dramatically in all the big battleground metros. This attracted strong criticism from the ANC and especially the SACP, which held demonstrations against the polls at the eTV offices in Johannesburg, accusing IPSOS of a “regime change agenda”. As if rattled by this, in the last week before the vote IPSOS brought out dramatically different figures, suddenly catapulting the ANC vote in Tshwane (Pretoria), for example, from under 30% to 47%. This was apparently achieved by altering the sample used in the last week. All that one can say is that such behaviour by a polling agency would be unthinkable in any developed country. Everyone knows that such huge changes in opinion do not really occur from week to week, so either the earlier polls or the last one must be admitted to be faulty. These weaknesses were compounded by IPSOS apparently failing to make much allowance for turnout factors. Indeed, the polls were always reported as if all respondents were intending to vote. South African voters are very prone to say they will definitely vote even though abstention rates are often high. On this occasion 57.97% voted compared to 57.6% in 2011. When the results were known some commentators excitedly claimed that the ANC vote had gone down everywhere, in the countryside just as much as the towns. Others claimed to see the effect of patronage politics in the fact that the ANC vote held up better where the “premier league” ruled. Peter Bruce inBusiness Day excitedly warned that the buffeting the ANC had taken in 2016 was as nothing compared to the complete hiding that awaited it in 2019 and even held out the prospect of a President Maimane after 2019. None of these conclusions can be justified. Let us take the last claim first. It may be that the decline in the ANC vote shown in 2016 will continue but the ANC has always done better in national elections rather than local ones because it is better able to pull out its massive vote then. The DA has fared correspondingly worse in national elections. So, if existing patterns hold, one would expect the ANC to recover somewhat in 2019 compared to 2016. Secondly, the dynamic factor in 2016 as compared with 2011 was the EFF’s entry into the mix. But when we get to 2019 we will be comparing back with 2014 when the EFF was already in the mix. Thirdly, 2016 offered Opposition voters the enticing prospect of displacing the ANC from power in major towns and cities, but no such prospect will be on offer in 2019. Talk of Maimane leading a government after 2019 are thus hugely inflated. In 2014, after all, the DA gained 22.23% of the vote, way short of the 30% target Zille had set. Even if past trends continue – and DA gains will be harder now – 26% of the vote in 2019 and 30% in 2024 would be a good achievement. The ANC still gets more than twice that. Of course, one cannot assume that the DA’s regular march simply continues at 3% every five years. 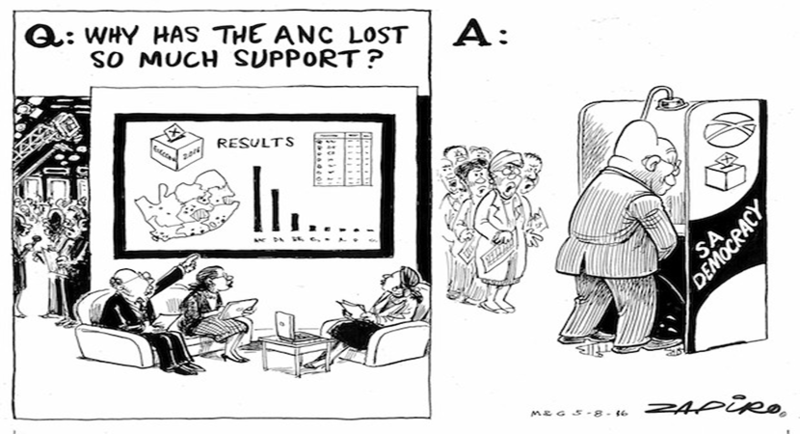 Its progress gets more difficult as it needs to hack into core ANC support. On the other hand a lot depends on whether the ANC is now seen as a declining party. Already party discipline has slipped considerably and individual ministers seem to do what they like – that is to say, a process of dis-aggregation appears to be under way. If people cease to believe that the ANC is destined to “rule until Jesus comes”, this will inevitably hasten its decline. Such decline could well be uneven and rapid: as an iceberg melts, bigger and bigger lumps fall off. It is certainly too soon to think this is bound to happen but far bigger and more monolithic parties than the ANC have vanished away. To quote a Russian book on the Soviet Union, “Everything was forever and then it was no more”. How well did the EFF do ? Most breakaways from the ANC (the PAC, UDM, Cope) have enjoyed an initial popularity but have failed to sustain it and rapidly fall into oblivion. But the EFF went from 6.35% in 2014 to 8.19% in 2016. This was far from the doubling or trebling that they had promised – and no doubt this was a sharp lesson to Malema and Shivambu about the hard realities of the slog they are now engaged upon. But on the other hand they are now king-makers in Tshwane and Jo’burg, as also in Rustenburg and Thabazimbi. In addition they have clearly built a base of sorts in Marikana and Limpopo province. Again, the EFF had made extravagant claims about their likely support in Limpopo and even at the last minute there were reports of polls showing them at 30% in the province. In fact they got 16.73%, a testament to the power of the tribal base, for Malema comes from Polokwane in Limpopo. This was, indeed, where the EFF peaked, with 28.21% of the vote. The DA took 10.98% (down from 11.38% in 2011) and the ANC 57.16%, down from 79.27% in 2011. Modimolle/Mookgopong where the DA won 7 seats, the EFF 6, and Others 2 against the ANC’s 13. This municipality, which includes Naboomspruit and Nylstroom, has seen violent ANC factionalism, large scale protests occasioned by water cut-offs and in general bad governance. Thabazimbi, where the EFF is disputing the result. In this iron-mining centre (2m. tonnes are mined annually here), the ANC won 45.8% of the vote, the DA 22.21%, the EFF 20.24% and the Thabazimbi Residents’ Association 8.14%. Logically, both councils might thus produce DA mayors, an ironic result of the EFF surge. Overall, the EFF displaced the DA as the main Opposition in the province. The EFF’s most dramatic result, however, was in Rustenburg, a tribute to how successfully the party has identified itself with the martyrs of Marikana. Here the ANC won 43 out of the 89 seats in play, the EFF 24, the DA 14 and Others 8. Thus if the latter three were to get together this could have become the only municipality in the country with an EFF mayor. Perhaps most impressive is the fact that the EFF has built on the 20.22% it won here in 2014 and this time took 26.76%. It did best of all in Nelson Mandela Bay (PE) where it gained 6.58% and the ANC lost 10.99%. The EFF took 5.12% and the United Front 0.94%. (Numsa, the UF’s sponsors, thus received a hard reception into the world of party politics where the fabled political influence of the unions just melted away.) Even so, the DA’s progress in NMB over the past decade has been striking – it has almost doubled its share of the vote. The DA also captured Kouga (Jeffery’s Bay, Humansdorp), so it now has a commanding bridgehead in the Eastern Cape. Overall in that province the DA won 19.7%, up from 16.4% (+3.3%), while the ANC fell from 72.35% to 65.31% (-7.04%). The EFF took 5.18%. However, the DA’s further progress here may be difficult: its most obvious target, Buffalo City (East London) remains ANC by a heavy margin. The DA’s other great success was in the Western Cape where its vote rose from 58.11% to 63.33% (+5.22) and the ANC fell from 34.1% to 26.22% (-7.88). The EFF took 2.81%. What this meant was that the DA gained control (sometimes in alliance with third parties) in great swathes of the province where its writ did not run before. Most notably, it gained control of the last municipality in the province in which the ANC had had a majority, Beaufort West – this despite the boast of the ANC mayor, Truman Prince that “only God can remove me from office”. In fact, as Table 3 shows, the DA has shown a remarkable progression in the town, perhaps through divine providence. Beaufort West is one of 8 hung municipalities in the Western Cape. All the others have DA majorities. Most of the 8 will end up with DA-led coalitions. Without doubt what we are looking at here is the progression of the DA among the province’s Coloured electorate. Having won over this group first in Cape Town, the “DA effect” is gradually radiating out from the provincial capital into the smaller towns and the countryside. With the conquest of Beaufort West it has now spread to the borders of the Northern Cape and the question is how far the DA can now spread into that province. In fact in 2016 the ANC fell from 63.78% to 58.26% in the Northern Cape while the DA rose from 22.1% to 24.85%, and the EFF took 8.6%. COPE fell here from 11.79% to 2.54%. Thus the Northern Cape, despite its unpromising sociological profile, has already become the third biggest DA target after the Western Cape and Gauteng. Nama Khoi (Springbok) where in 2011 the DA (35%)and COPE (15%) had actually won control of the council from the ANC (49%). In 2016, however, the COPE vote collapsed and the ANC picked up enough of it to rise to 56% in 2014. This produced a hung council with the ANC taking 8 seats, the DA 7 and Others 2. Finally in Kgatelopele (Danielskuil) the ANC had led the DA by 5 seats to 2 with 1 Other, thus producing an easy ANC majority. 2016 ended that leaving the ANC with 3 seats to the DA’s 2 with 2 Others. The DA’s greatest success in the Western Cape came with its increased majority in Cape Town itself. The Cape Town result is notable for several reasons. First, the DA result came as no surprise after a sustained period in which Capetonians have been made thoroughly aware by the City and the local media that Cape Town is enjoying the fruits of good governance – higher economic growth and lower unemployment, that there is a continuing inflow of migrants to the city both of affluent “semigrants” from the rest of South Africa and penniless work-seekers from the Eastern Cape, Zimbabwe, the DRC and elsewhere. Its boom status is signalled by record house prices in Clifton/Camps Bay and above average house price increases elsewhere despite the zero-growth economy. The general feeling was “why change a winning formula?” and sufficient citizens have memories of the chaotic conditions reigning under the last ANC administration in 2001-06 for that to be a powerful theme. Second, the ANC had always previously chosen a Coloured candidate for mayor because it was accepted that no party could win without pivotal Coloured support, yet this time the ANC selected an African candidate, Xolani Sotashe, a symbolic admission that it had given up all hope of winning and was now concerned merely to defend its heartland of Khayelitsha. For the DA attacked hard this time and achieved new highs in a number of Khayelitsha wards. Everywhere the ANC vote crumbled while the DA racked up record majorities in the suburbs. The real point about the DA landslide is best seen through the demographic data. Cape Town was for long kept a city of whites and Coloureds. In 1944 the whites constituted 47% of the population, the Coloureds 46%, Asians 1% and Africans under 6%. With the collapse of the pass laws and then of apartheid there has been a huge African inflow so that by 2011 the population was 15.7% white, 42.4% Coloured, 38.6% African and 1.4% Asian with 1.9% Other. Without doubt that inflow has continued apace over the last five years so that by 2016 it is likely that the biggest population group in Cape Town was Africans. One might have imagined that this would bring a ballooning ANC vote and yet the opposite has occurred, testimony to how completely the city now lives within a DA bubble. Most attention was, naturally, on the battles in Gauteng, particularly those for the three big metros of Johannesburg, Ekurhuleni and Tshwane. Across the province as a whole the ANC fell from 60.48% to 45.86% – a loss of 14.62%. This was mainly due to the EFF which took 11.36%. The DA improved from 33.31% to 37.21% (+3.9%). Thus of Gauteng’s nine councils, the DA easily held Midvaal and four more were hung (Johannesburg, Tshwane, Ekurhuleni and Mogale City (Krugersdorp)). JO’BURG. The DA went from 34.62% in 2011 to 38.37% (+3.75%) while the ANC fell from 58.56% to 44.55% (-14.01%) and the EFF took 11.09%. TSHWANE: The DA rose from 38.74% in 2011 to 43.11% (+4.37%) while the ANC fell from 56.46% to 41.22% (-15.24%) and the EFF took 11.7%. EKURHULENI: The DA rose from 30.29% to 34.15% (+3.86%), while the ANC fell from 61.63% to 48.64% (-12.99%) and the EFF took 11.23%. Overall, the swing in fortunes was the highest of all in these large metropoles. The reason for this lay not only in the high EFF vote but in the fact that the DA gain here was considerably greater than the national average. This would appear to be in line with the phenomenon observed elsewhere (eg Paris, London) whereby the capital city exaggerates the national trend. However, only in Tshwane did the DA pull ahead of the ANC with a particularly large swing. The ANC vote went down almost everywhere. Its best result by far was in KwaZulu-Natal where its vote was essentially steady – 57.82% this time compared to 57.48% (-0.34%) in 2011 while the DA rose by 2.9% to 15.16% from 12.26%. The EFF garnered only 3.46% here. But the IFP surged to 18.29% in the absence of the NFP. The result was that the IFP now holds 6 municipalities (Ulundi, Nongoma, Msinga, Nkandla, Big Five Hlabisa, and Mthonjaneni) while seven more (Nquthu, Endumeni, Jozini, Mtubatuba, eDumbe, Uphongolo and Abaqulusi) are hung. Yet in eThekwini (Durban) the ANC sagged badly from 61.07% to 56.01% (-5.06%) while the DA increased from 21.02% in 2011 to 26.92% (+5.9%), which meant the DA took ten wards from the ANC and rose from 43 seat to 61. There had been bitter factional fighting within the ANC as its new city leader, Zandile Gumede, replaced all councillors loyal to the defeated leader, James Nxumalo, with her own followers. It was doubtless important to her that they all kept their seats. In effect this was achieved by the enlargement of the council to 215 seats from 205 in 2011. This enabled the ANC to keep exactly the same number of seats (126) as before. Although the EFF took 8 council seats, the real phenomena were (i) the complete disappearance of the NFP (which had held 10 seats) due to their failure to file papers in time and (ii) the collapse of the Minority Front from 11 seats to one following the death of its leader, Amichand Rajbansi. Virtually all the MF’s voters appear to have bolted to the DA which also seems to have been the main beneficiary of the NFP’s absence – the IFP took only one extra seat, going from nine to ten. It was these gains rather than the ANC’s losses which essentially accounted for the DA’s success in the city. In Msunduzi (Pietermaritzburg) there was no reflection of national trends at all. The DA went up from its 2011 score by a mere 0.05% to 19.23% while the ANC rose by 0.74% to 66.09%. Taken together with what we have observed in previous elections, there seems little doubt that the greater solidity of the ANC vote in KZN derives from essential tribal reasons. Elsewhere, in the Free State the ANC vote plunged by 10.05%, down from 71.56% to 61.53% but the DA also fell – from 20.38% to 19.87% (-0.51%) while the EFF took 9.69%. The ANC held all the municipalities here save one – Metsimaholo (= Sasolburg) which saw a remarkable evolution with the ANC falling from 63% to 45.08% (-17.92%) while the DA also fell from 35.2% to 28.97% while the EFF romped in with 17.87%. Mangaung (Bloemfontein) saw a far smaller swing and the ANC easily retained control. In Limpopo the ANC fell from 82.67% to 68.75% (-13.92%) but again too here the DA also fell from 8.06% to 6.64% (-1.42%), the ANC’s poor performance being solely due to the EFF. In Mpmumalanga the ANC fell from 79.19% to 70.74% (-8.45%). The DA also fell from 13.68% to 12.93% while the EFF took 9.39%. Thus the ANC won all municipalities, as before. Only in Bushbuckridge did the ANC lose wards – to the Bushbuckridge Residents Association. The BRA, a splinter from the ANC prior to the 2011 elections, won 18.09% in Bushbuckridge, thus doubling its council seats from 7 to 14. This was a striking performance – usually splinter movements begin to fade away at their second election but the BRA did the opposite. In the North West the ANC fell from 75.4% to 59.36% (-16.04%) while the DA fell from 15.91% to 15.02%. The EFF took 15.54%. The most competitive election here was in Tlokwe where the ANC just held off a strong challenge from the DA and Independents, winning 34 of the 67 seats at stake with the DA winning 22 seats and the EFF 5 seats. Without doubt all that saved the ANC here was the amalgamation of its stronghold, Ventersdorp into the Tlokwe municipality not long before the election. This had led to violent protests in both municipalities against the merger with the EFF accusing the ANC of “turning South Africa into an Animal Farm where all are equal but some are more equal than others”. Generally when such mergers take place the more prosperous area resents being lumped together with a less prosperous area, for obvious reasons. But this was an unusual case where neither town wanted the merger. Nonetheless, it was forced through by Pravin Gordhan, then Minister for Co-operative Governance. Mr Gordhan is currently being hailed as the country’s saviour but it is worth pointing out that this was a quite shameless and cynical gerrymander. The final result was, naturally enough, aided by the plentiful distribution of food parcels by the ANC. 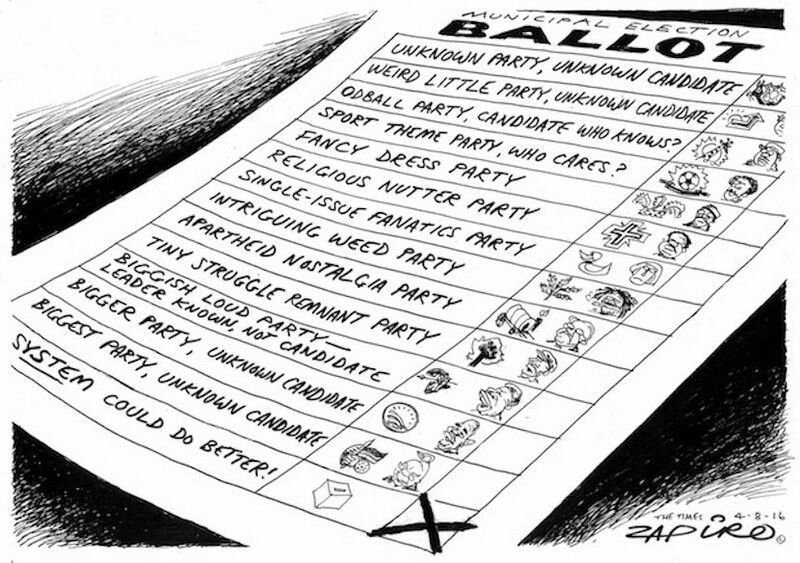 Zapiro’s election roll, more magic at www.zapiro.com. It is best at this point to look back to Table 1. Although it can be said that the ANC lost everywhere, in both rural and urban areas, the real key is that it lost most where the EFF did best. In crude terms this was in the big cities of Gauteng and thus more urban votes were lost. But the swing against the ANC in the (rural) North West and Limpopo was just as big. On the other hand sub-average swings away from the ANC were seen in every other province except for Free State. Thus the ANC vote held up better in the countryside as a whole, so the claim that the ANC lost equally in urban and rural areas is not true. Second, it has been claimed that the ANC vote held up best where the “Premier League” ruled and where the patronage networks were at their most powerful. This argument is not rational. Nowhere, after all, did the ANC control more patronage than in the huge Gauteng metropoles where it did so badly, and the highest swing of all away from the ANC took place precisely in one of the “Premier League” provinces, Supra Mahumapelo’s North West. But this claim is in any case intellectually confused. A moment’s reflection reveals that the huge budgets of the metros provide far greater patronage than anything that is available in rural areas. Moreover, one needs to distinguish between national patronage (jobs and tenders in national government and parastatals, pensions and social grants) and local patronage (jobs and tenders from provincial and municipal government, RDP housing). Again, a moment’s reflection shows that there is far more of both kinds of patronage in large metropolitan areas. Thus the whole notion of equating the Premier League provinces (North West, KwaZulu-Natal, Free State and Mpumalanga) with a denser concentration of patronage networks is false. Third, it seems far more likely that the ANC’s better performance in rural areas has more to do with the party’s growing reliance on traditional chiefs and on the relatively stronger chieftaincy in Nguni areas (the Tswana chieftaincy in the North West is far weaker). In many rural areas it is common for the chiefs to marshal their followers towards an ANC vote by arguing that if the voters want to continue to benefit from the pensions, social grants and RDP housing which “the ANC gave them” they had better vote for the party. Chiefs and headmen frequently insist that they will know how everyone voted and that any defectors are likely to fare poorly when the chief comes to distribute land. And it should not be forgotten that the chiefs enjoy judicial functions and that they and their headmen are quite capable of physical intimidation as well. The poor rural peasantry is not in a strong position to resist such pressures and quite often Opposition parties find it difficult even to gain access to rural electorates. The main thing which distinguishes the urban vote is the absence of such chiefly monitors and enforcers, not a lack of patronage. Fourth, what is one to make of the DA’s shrinkage in North West, Limpopo and Mpumlanga? The key is surely the fact that there is no metropole in any of them, nor even a city as big as Mangaung. 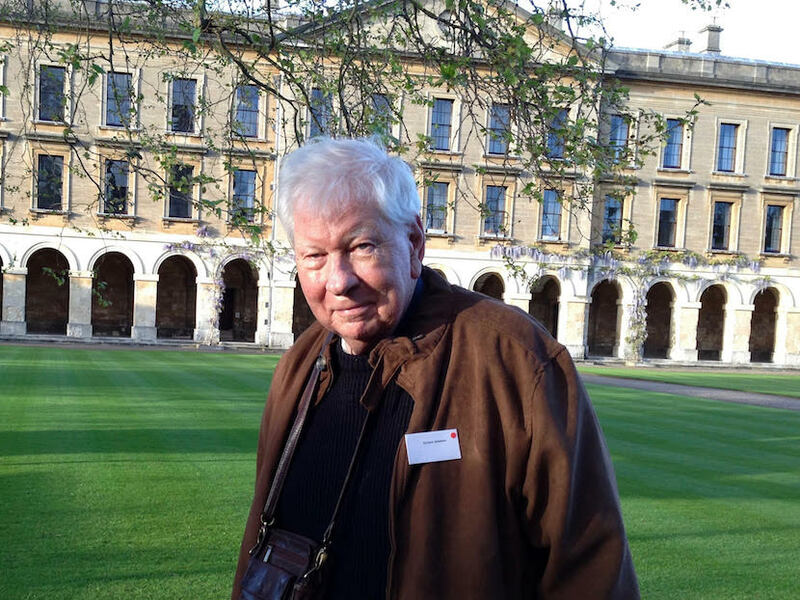 It has to be realised that the advent of democracy saw strong pressures exerted on the country’s white population to move to larger urban centres – where there would still be mainly white neighbourhoods with good schools and other facilities. The result, as in Zimbabwe several decades before, was the effective abandonment of smaller towns by whites. This is still going on apace with, for example, the large “semigration” to Cape Town. It is quite likely, in other words, that the DA’s white core electorate in these provinces is shrinking. Finally, the ANC’s performance continues to be heavily reliant on the tribal mobilization of the Zulu bloc behind Zuma. And the worse the ANC does in the rest of the country, the more its reliance on that bloc grows. As they lose control of one metro after another their eThekwini stronghold becomes more precious than ever. Yet that mobilization is far less than complete: if it were, the ANC would be getting 80% in KwaZulu-Natal, not 58%. And that bloc is no longer growing while more recent ANC statistics show a huge fall in ANC membership in the province, as also elsewhere. Does this then leave one with a looming future of an inexorable blue tide ? Not necessarily. Even if one looks a little harder at the Western Cape it is clear that the DA has significant problems. In Cape Town Patricia de Lille is something of an unguided missile and, in the opinion of many, she is far too friendly with property developers. She also stands accused of promoting her personal cronies to key jobs in preference to better qualified applicants. There is also far too much personality cult advertising: it hits you the minute you step off the plane in Cape Town. This never occurred under Helen Zille. In the past the DA has ensured a healthy turnover of mayors but De Lille has insisted on staying put. Many DA voters were horrified to see De Lille urging that the party try to accommodate EFF demands for the expropriation of land, pointing to municipal land for a start. This has stirred uncomfortable memories of De Lille’s PAC background and her visceral dislike of the “white” DA in 2006 which led her to oppose co-operation with the DA until forcibly hauled into line by her own followers. Plucking De Lille out of a small and dying party to become the DA’s boss in its greatest stronghold was a strange initiative by Helen Zille, rather comparable to her attempt to enthrone Mamphela Ramphele as DA leader when Ramphele so disliked the DA that she refused even to join it. The Ramphele gambit did not end well. The jury is still out on De Lille. The DA also has problems even in its blue chip towns along the Garden Route. Take Knysna. The DA won 10/19 seats here in 2011 with 50.5% of the vote. But its administration has drawn strong local criticism. It is accused of keeping very much the same administration that ran the town under the ANC with the result that things work now pretty much as they did then. The result is a distinctly restless and dissatisfied DA electorate. It had nowhere much else to go in 2016 but it was notable here that COPE kept much of its 2011 vote – despite trends elsewhere – and the DA vote actually fell slightly to 50.15%. The result is that the DA won only 9/19 seats and must now govern thanks only to a deal with an Independent. Again, take Bitou (Plettenberg Bay). In 2011 the DA (48.02%) overtook the ANC (45.75%) and the DA (6 seats) did a coalition deal with the COPE councillor, giving it 7 of the13 seats. The key here was the ex-ANC leader, Memory Booysen, who had joined the DA, bringing precious African support with him. He became mayor. But things were rocky: there was a bad housing scandal and an electricity theft scandal and the single COPE councillor then switched to support the ANC and proposed a motion of no confidence in Booysen. At which point a by-election gave the DA 7 seats and a majority. But trouble has continued. There has been a major sexting scandal in which Booysen was accused of propositioning a young black woman who had applied for a municipal job. He denies it; she says he is lying; the ANC has published the incriminating SMS correspondence. It bears every comparison with the equally published sexting of Marius Fransman. This was reflected in the results in 2016. Although the ANC continued to fall to 41.76%, the DA stayed still at 48.95%. The Active United Front (part of the UF) came in with 5.36% and took one seat. The ANC and DA got 6 seats each and the AUF has sided with the ANC, putting them in power – a disastrous result for the DA in what should have been a plum municipality. Both these municipalities should be impregnable DA strongholds. In practice the DA is going backwards in both of them. The voter says, yes you did. “And when your Dad was unemployed I managed to find him a job in the Post Office”. The voter says, that was great, I’m really glad you did that. “And when your mother was left destitute I managed to make sure she got Medicare and Social Security”. The voter agrees that that was excellent. “So why the hell are you hesitating to support me?” Well, says the voter, what have you done for me lately? This story is republished with permission from the author and Politicsweb where it first appeared.